You are here: Home › Frequently Asked Questions › Is it time to consider creating an Enduring Power of Attorney? Is it time to consider creating an Enduring Power of Attorney? 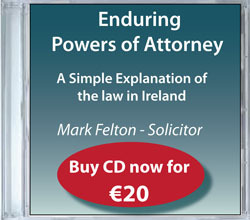 The general view is that only older people need an enduring power of attorney. Why, one could argue, would anyone else ever need it?. Like a lot of things though, timing is essential. it is critical that you create an Enduring Power of Attorney at a time in your life when there is no question at all about your mental capacity. Your doctor has to sign a certificate in the Enduring Power of Attorney to say that at the date you sign it you have the necessary Mental Capacity to fully understand the nature and consequences of completing the documentation. This is an important reason why you should complete the Enduring Power of Attorney at the earliest possible time. You can change your mind about the people you appoint as your attorneys later on if you wish to.